The CytoViva 3D Enhanced Darkfield Imaging System provides a method for locating non-labeled nanostructures (particles, tubes, etc.) in a variety of translucent matrices (cells, tissue, organisms). This technique leverages the high signal-to-noise optical performance of the patented CytoViva Enhanced Darkfield Microscope Technology in combination with patent-pending deconvolution and particle location routines to provide users with a three dimensional optical model of their sample. Most importantly, this technique does not require the use of fluorescent labels on the nanoparticles to obtain an image of the particles, thus removing the potentially negative influence of these labels on the sample. The 3D image is created by acquiring and storing a “stack” of equally spaced two dimensional images using the CytoViva Enhanced Darkfield Microscope Technology, a piezo-driven Z-axis stage and CytoViva’s proprietary image acquisition and control software. 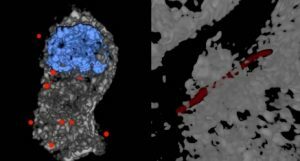 This stack of images is then processed using CytoViva 3D Image Analysis ImageJ plug-ins to locate the subject particles, as well as, deconvolve the surrounding cells, tissue or other translucent matrix. The resulting optical image is then viewed in an ImageJ 3D viewer. The use of ImageJ also allows further processing of the data in an environment familiar to many users. The images above illustrate three examples of the 3D capability. Figure 1 is a 3D deconvolution of nanoparticles (NPs) in a cell with the NPs in red, the nuclear structure in blue and the cell structure in gray. Figure 2 is a 3D deconvolution of a carbon nanotube piercing a tissue section. The CytoViva 3D Enhanced Darkfield Imaging System is designed to facilitate research in a variety of applications in nanobiology (targeted drug delivery and pathogen detection), nanotoxicology (nanoparticles and carbon nanotubes in tissue), and others where it is useful to understand the location of nanostructures in a three dimensional space. 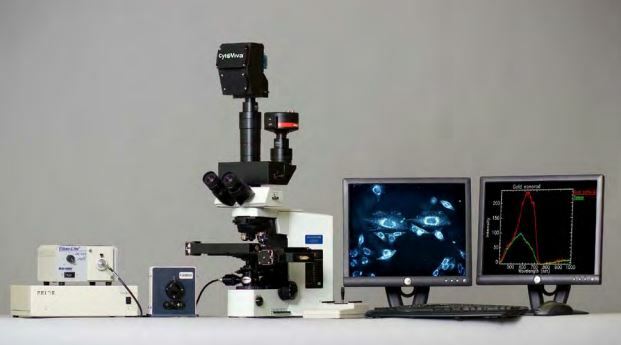 This capability is fully compatible with CytoViva’s Hyperspectral Imaging system and can be operated on the same microscope platform, thus allowing existing systems to be easily upgraded to include this capability.